The Sony Xperia Z2 tablet had been unveiled at the the Mobile World Congress 2014 in Barcelona, Spain recently and is considered by many as the most exciting device against others which were also introduced at the event. It was supposedly built to battle it out with the iPad Air. But question is, will the Sony Xperia Z2 tablet match the iPad Air? When it was released, there was no doubt that the iPad Air was the lightest and thinnest tablet in the planet. It measures 9.7 inches (240 mm) in height, 6.6 inches (169.5 mm) in width, and only 0.29 inch (7.5 mm) in width plus weighs only 1 pound (469 g). The Sony Xperia Z2 challenges that with only 6.4mm in width and 439g (for the LTE version) or 426g (for the Wi-Fi model) in weight despite a large 10.1” screen. Both devices look physically stunning with their metal and glass overall built. Although the Air looks more elegant and classy physically, the Z2 tablet boasts of an exceptional feature: it is IP58 water, scratch, and dust resistant, making it remain neat looking even with minimal cleaning alone. IP or ingress protection measures a device’s resistance to both water and dust. Speaking of being waterproof, the Z2 can survive under the sink amongst your dishes or in the tub when you bathe. You can also take pictures even when swimming underwater. As for resolution, the Z2 tablet comes with a 1920 x 1200 Triluminos Display with IPS technology. It is impressive although the Air’s 2048×1536 resolution with 264 pixels per inch (ppi) is larger. Triluminos Display provides more spectrum of colors. It also comes with the X-reality features which enable razor sharp images than ever by reducing pixels, improving outline and texture, enhancing color and contrast, and noise reduction for videos. The 5mp iSight camera for the Air is left behind by Z2’s 8MP. For video calling sessions, the Air is beaten again with its 1.2 MP FaceTime HD camera against Z2’s 2.2MP offer. You can also take pictures even with low light conditions and capture videos with low noise levels with the Z2 tablet through the Exmor RS™ for mobile technology. The Air’s well celebrated A7 processor and M7 coprocessor are only powered by 1.4GHz dual core, whereas, the Z2 tablet comes with Qualcomm® Snapdragon™ 801 2.3GHz quad-core processor with the Adreno 330 GPU (20% better than 320). This is comparable to the likes of phones that are as powerful as computers and can support HD as well as 3D video gaming. The 8820 mAh is exceptional for the Air and promises to deliver up to 10 hours of usage even when surfing the web via Wi-Fi. The Z2 comes short with only 6000 mAh but offers a battery stamina mode to conserve battery consumption. It’s the operating system battle which cannot declare any winner yet. Z2 tablet runs on Android 4.4 KitKat while Air comes with the latest iOS7. By the way, there is a different Sony Xperia Z2, a smart phone, just so no one gets confused between the upcoming tablet and the released phone version. We are of course discussing the tablet in this post. Sound – experience 3D surround sound speakers, digital noise cancellation, and Clear Audio technologies which include Clear Stereo, Clear Bass and Clear Phase. The latter is an audio technology lessens distortion and improves balance as well as clarity. Siri – as always, built in feature enables voice recognition and voice command to perform functions like sending messages, setting reminders, and more. 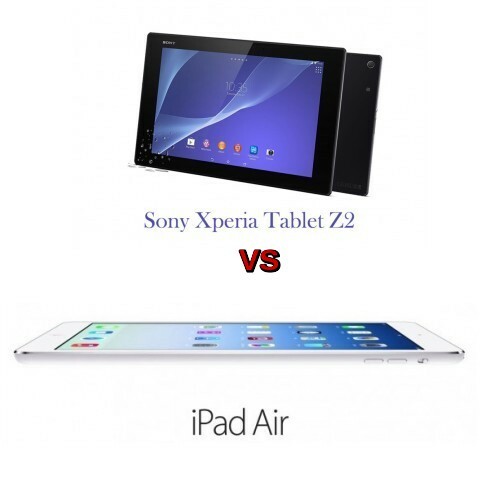 Winner between the Sony Xperia Z2 tablet and the iPad Air? Based on several factors we have compared, the Sony Xperia Z2 tablet appears to be victorious over the iPad Air but for Apple lovers, whose lives had been changed by this thin and light iPad (although no longer the thinnest and lightest now), the latter is still the winner. This entry was posted in iOS, iPad, News and tagged iPad Air, Sony Xperia Z2 tablet. Bookmark the permalink.